I am a member of our local Community Facebook page and more frequently I am seeing advertisements for local homes available for rent - with no links to a Trademe listing. �While a Trademe listing may be present is this the start of a trend? �Is Trademe in trouble from Facebook? BTW, the reason this is indexed to the earthquake is that there was a reduction of houses available at that time - over-construction that followed has now led to over-capacity. 6. �Supply - Cost of construction doubled in the last 10 years due to regulatory changes, ceasing build to rent. Auckland is almost at equilibrium. �The construction boom is likely to meet a demand shortage at the prices required to create a rental house. 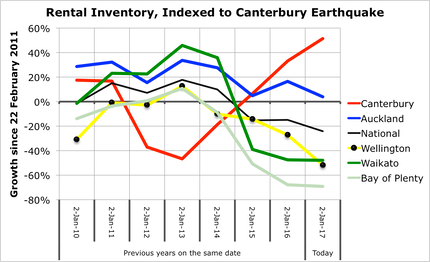 Wellington, Hamilton and Tauranga all continuing to run out of houses for rent, Tauranga seems to have turned the corner (not visible in this chart) but Wellington and Hamilton are continuing to show a reduction in supply.